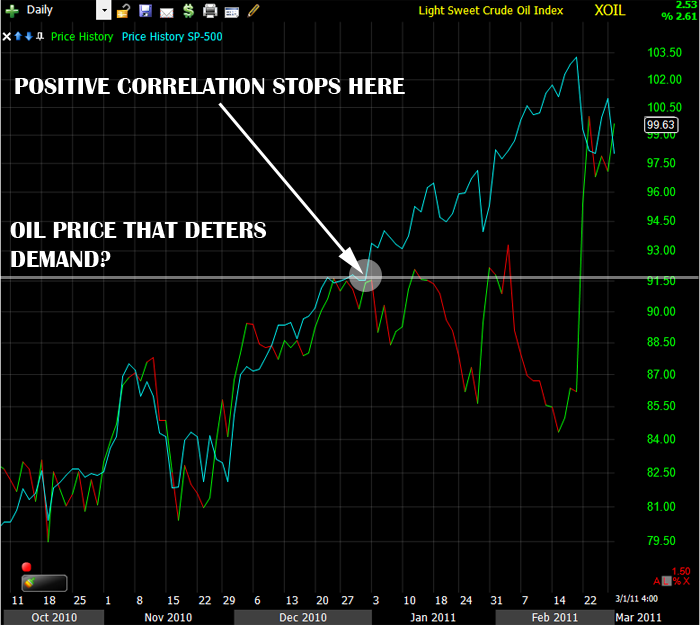 I did not realize until right now that the market is perfectly moving in the opposite direction of the price of oil. At the beginning of the year, we’ve passed a point in the oil price that people think would deter demand. Look at this graph. The cyan is the SP-500 and the colored is XOIL. If this pattern holds for a while, we would see the market open up when the oil trades down and is held down when the market is open and vice versa. While watching Light Sweet Crude Oil Futures for April delivery trade down, I’ve also seen an uptick in the Emini SP-500 or SP futures. I’m guessing that if we reach $98 on the April contracts, we might see some downside to oil. As of right now, it’s trading at $99.58.